In 1976, Chief Wilton Littlechild had the distinction of being the first Treaty First Nation person to acquire his law degree from the University of Alberta. In June of 2007, the University of Alberta bestowed the Doctor of Laws Degree on Chief Littlechild for his outstanding achievements. He is a strong advocate for the rights of Indigenous Peoples and promoter of implementation of the treaties between the Indigenous Peoples of Canada and the Crown, now represented by the federal government. Chief Littlechild served as a Member of Parliament from 1988 – 1993 for the riding of Wetaskiwin-Rimby. He served on several senior committees in the House of Commons and was a parliamentary delegate to the United Nations. Chief Littlechild organized a coalition of Indigenous Nations that sought and gained consultative status with the Economic and Social Council of the United Nations. He was re-appointed by the E.C.O.S.O.C. President to represent North America and has completed his second and final term as the North American representative to the UN Permanent Forum on Indigenous Issues. Chief Littlechild was appointed the Honourary Chief for the Maskwacis Crees and also honoured by the Chiefs of the Confederacy of Treaty Six First Nations as the International Chief for Treaty No. 6 Confederacy. He was elected by the Chiefs of Treaties 6, 7, 8 (Alberta) as the Regional Chief for the three Treaty territories in October of 2006 to serve a three-year term. 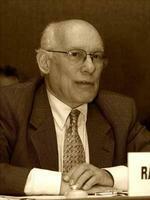 Rodolfo Stavenhagen is a distinguished Mexican sociologist and former Deputy Director General of UNESCO. Stavenhagen has been identified as a pioneer on Indigenous rights. In 2001 he was appointed by the United Nations Commission on Human Rights the first United Nations Special Rapporteur on the situation of the human rights and fundamental freedoms of indigenous people which he served until 2008. He has many publications on Indigenous rights including: Indigenous Peoples and the State in Latin America: An Ongoing Debate (2000); Building Intercultural Citizenship through Education: A Human Rights Approach (2006); and Making the Declaration Work (2006). Mr. Sven-Roald Nystø (Norway) is a Lule Sami politician from Storå in Tysfjord, born in the municipality of Tysfjord, Nordland County. He was the president of the Sami Parliament in Norway 1997-2005, and worked with indigenous peoples issues in that capacity at the Nordic and Arctic level. He represented the Sami in the Standing Committee of the Parliamentarians of the Arctic Region for four years. Currently he works as R&D Leader at the Árran Lule Sami Centre, Tysfjord and is the Chair of the Board at the Centre for Sami Studies, University of Tromsø-The Arctic University of Norway. He was a member of the Norwegian Governments Expert Commission on High North Affairs 2007-2009, has 14 years of experience from the Norwegian Royal Commission on Sami Rights and 30 years from various Non-Governmental Sami organizations. He holds a Master of Philosophy in Polar Studies at Scott Polar Research Institute, University of Cambridge, United Kingdom (2011). Luis Vittor is a Peruvian economist and adviser to the Andean Coordinator of Indigenous Organizations and the Confederation of Peruvian Communities Affected by Mining. He is of Quechua origin and was born in Cerro de Pasco, Peru. From 2008-2009, he was a Fellow in the Indigenous Peoples, Human Rights, Governance & International Cooperation program at the University Carlos III of Madrid (Spain). He is the author of Resistencias comunitarias a la minería: la experiencia de CONACAMI (Community Resistance to Mining: the CONACAMI experience, 2008), among numerous other publications. Roger Maaka, Ph.D., Ngati Kahungunu, is a Professor of research and Maori and Indigenous Studies at the Eastern Institute of Technology, Taradale, New Zealand. His research interests include: Indigeneity as a global social movement, contemporary Indigenous identities and social development with a focus on post-treaty settlement co-governance including the management and protection of the environment and natural resources. Ovide Mercredi is a Cree born in the northern community of Grand Rapids in 1946. He served his community as Chief of Misipawistik Cree Nation from 2005 to 2011. He is now a councillor. A graduate of the University of Manitoba with a Law degree he practiced criminal law and later specialized in constitutional law as an advisor to Manitoba Chiefs. Mercredi has worked tirelessly for the rights of First Nations people throughout Canada. He is known as a First Nations leader that speaks eloquently with great passion and clarity. In 1989, he was elected Regional Chief of the Assembly of First Nations for Manitoba. He became a key strategist for the Assembly during the time of the Meech Lake Accord constitutional reform discussions. He also had a strong leadership role in helping to resolve the Oka Crisis in 1990. Ovide Mercredi was elected as National Chief for the Assembly of First Nations in 1991. During his first term he led the negotiations for the First Nations in the Charlottetown Accord. He was re-elected in 1994 and served as National Chief until 1997. He addressed the United Nations in Geneva and New York. He led a human rights delegation of Canadians to the troubled area of the Mexican state of Chiapas. In addition to serving as a lawyer and politician he co-authored “In the Rapids: Navigating the Future of First Nations” with Mary Ellen Turpel-Lafond in 1993. He has contributed articles to other publications. In his spare time, he enjoys painting and writing poetry. Mr. Mercredi is an advocate of non-violent methods for change and travelled to India when he was nominated for the Gandhi Peace Prize. He has received honorary degrees from Bishops University, St Mary’s University, The University of Lethbridge and Athabaska University. He received the Order of Manitoba in 2005. In 2010 the Peace and Justice Studies Association awarded him their Social Courage award. In 2013 he was selected as the Distinguished Alumni of the University of Manitoba. He is the National Spokesperson for Treaties 1 to 11, having been chosen in a traditional and customary manner in the summer of 2006. As National Chief he worked closely with Elders from all regions of Canada. As a Treaty Spokesperson, he has continued his practice of seeking the advice and support of traditional Elders. Ovide serves on the board of the Heart and Stroke Foundation of Canada and the Winnipeg Art Gallery. 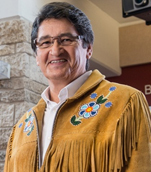 Ovide Mercredi is a strong believer in a positive future for all First Nations communities and recognizes the inherent strength and talents of First Nations people. He has always maintained that his people possess the answers to their needs and aspirations. To him healing can be accomplished by the simple application of traditional values such as respect and kindness.